In fact, that seems to be the case: Mojave doesn’t look much different than previous versions of macOS—that is, until you enable its marquee feature, Dark Mode. 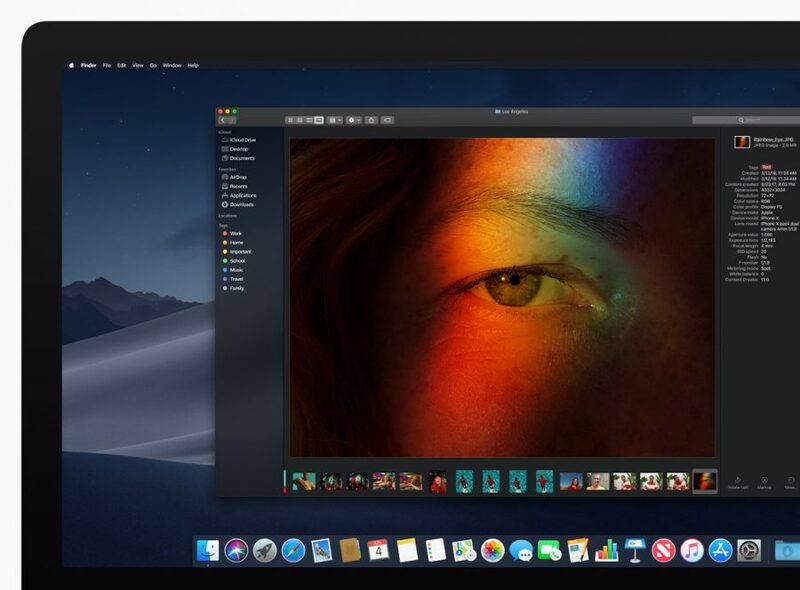 This affects the appearance of the menu bar, menus, and Desktop, as well as of any apps that have made use of the new Dark Mode API provided by Mojave. Enable Dark Mode and the difference between macOS 10.13 and 10.14 is as plain as night and day. Indeed, Dark Mode is one of those features that pro users of photo- and video-editing apps have long requested, and one that many non-pro users might want to use. Apple describes the feature as a way of reducing distractions and helping users focus on the task at hand. It uses a darker color palette for all windows, views, menus, and controls, and it employs vibrancy adjustments to provide contrast between foreground and background elements. 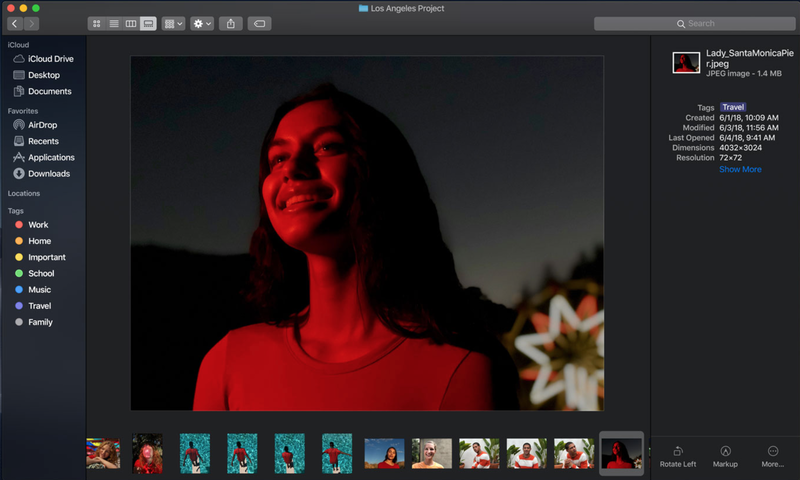 Until developers hop aboard the Dark Mode bandwagon, however, apps that will include Dark Mode designs when Mojave ships will likely be mostly the Mac mainstays such as Mail, Messages, Maps, Calendar, and Photos. How fast developers adopt Dark Mode depends on how easy it is to incorporate the Dark Mode API into existing apps. Furthermore, it remains to be seen, literally, how Dark Mode will work with multiple desktops in Mission Control, and how distracting a screen will look when containing windows from both Dark Mode-savvy and older apps. Apple’s site provides a quick way to compare Dark Mode with the more familiar look of macOS. Along with Dark Mode comes a cosmetic companion: Dynamic Desktops. These are Desktop backgrounds that change appearance depending on the time of day—for example, a desert scene in daylight that gradually transitions to the same scene at night. So far, it seems that Apple will be the sole provider of these animations, and users won’t have to worry about their cat wallpaper pictures becoming dark and strange after the sun goes down. Another change users may appreciate is the new Finder stacks capability (not to be confused with the Dock’s stacks). 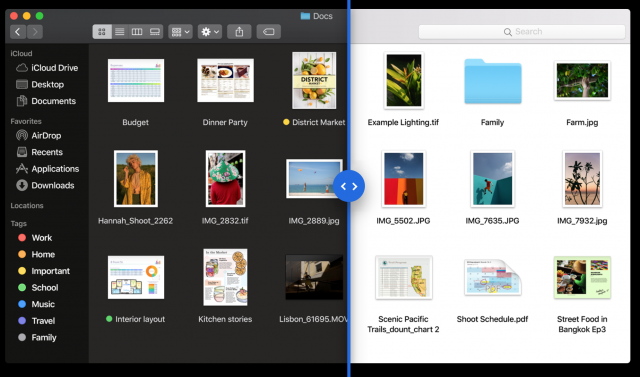 Users who have files scattered around the Desktop can use this feature to organize those icons by file type, date, tag, and other criteria into neatly arranged stacks that, when clicked, expand across the Desktop to show their contents. Users can also “scrub” the pointer across a stack to reveal and access individual items in it one by one. While some might find the Desktop-tidying effect of stacks a quick and pleasant way to clean things up, others who rely upon visual memory to find commonly used items may find the command much less useful, and, in fact, counter-productive to use. More generally useful may be Mojave’s replacement for the Finder’s Cover Flow view, now called Gallery View. The view seems optimized for navigating folders of graphics by presenting the contents with an expanded view of the current item filling most of the Finder window. A row of thumbnails below it represents other items in the folder, and a preview pane to the right provides complete file metadata information, similar to Get Info. The view also offers a collection of Quick Actions for you to modify the selected file without opening an app. For example, an image file might have actions for rotating it, marking it up, or converting it to another image format. You aren’t limited to Apple’s set of Quick Actions, as you can create Automator tasks to perform Quick Actions as well. Quick Look has also been enhanced to allow you to perform actions on many types of files, such as markup, image rotation, and file sharing. The actions provided in Quick Look vary depending on the type of file you are viewing. Apple has significantly enhanced its native screenshot capabilities. Now when you press the screen capture shortcut, you get a palette of different screenshot tools. You then click to choose whether to capture the screen, a window, or a selection—or to record a movie of your actions. With the last, you can record the whole screen or a selected portion. You can specify a custom destination for your screenshot or leave it in a thumbnail on the Desktop where you can immediately perform actions on it, such as marking it up, sharing it, cropping it, or deleting it if it isn’t what you intended. Related to screenshots is Continuity Camera. This lets you use an iOS device’s camera with Mac apps. For example, you can shoot a photo of a receipt on your iPhone and have it appear—straightened and ready to use—on your Mac Desktop as a PDF, or you can choose Insert Photo from the Mac version of Pages and then take a photo with your iPad to supply the photo. Certain Mac apps will come with the Continuity Camera capability built-in, including the iWork apps, Mail, and Notes. Federighi posed the question “Is Apple combining macOS and iOS?” and immediately answered it with a resounding “No!” But that doesn’t mean that the two operating systems won’t be connected in new and interesting ways. Continuity Camera, described just above, is one of those ways. Another is the Group FaceTime call capabilities that both iOS 12 and Mojave offer: with it, a FaceTime chat can include as many as 32 participants. In a group FaceTime chat, the app smartly highlights the participants who are currently speaking—a virtual Thanksgiving dinner in the U.S. this autumn might be a perfect venue for taxing that capability! Apple is also working on making it easier for developers to design apps that can work on both macOS and iOS. The plan is to migrate some of iOS’s UIKit framework to macOS so that, say, a finger gesture in iOS can be seen on the Mac as a trackpad gesture. This year, Apple is testing this strategy out on their own apps: four iOS apps—News, Home, Voice Memos, and Stocks—have undergone the sea change to make them into Mac apps as well. Once Apple proves and refines the strategy, it plans to make the necessary frameworks available to developers in 2019. Mail in Mojave sports an Emoji button that will make it easier to add colorful glyphs, and the app also can suggest where to file a message when you select it in your Inbox. Siri is learning more—Apple touts food, celebrities, and motorsports as some of the domains about which Siri is getting educated. Also, the digital assistant gains more capabilities: Siri in Mojave can help you find saved passwords and control HomeKit devices. Safari in Mojave can now show favicons in your open tabs. New privacy protections have been implemented, such as automatic strong passwords in Safari, intelligent tracking prevention that keeps websites from tracking you easily, and better device and data controls so that third-party apps must ask permission to use your camera, microphone, and stored Messages and Mail data. One user-facing feature of interest to developers will be the revised Mac App Store, which offers better discoverability and highlighting of apps, and the capability of asking for ratings and reviews from within an app (a feature this writer hopes will seldom be invoked). Apple, however, remained silent in the keynote about many features for which developers have long clamored, such as the ability to offer paid upgrades. A new Network framework to make it easier to establish various types of network connections. A new Natural Language framework that can analyze natural language text and deduce appropriate language-specific metadata. A more powerful Metal, the graphics API that drives most of the computational graphics in macOS. So central is Metal to Apple’s future, in fact, that it is deprecating both OpenGL and OpenCL in Mojave and is restricting Mojave to Macs that can use Metal: that is, Macs released in mid-2012 or later. Otherwise, unless you have an old Mac Pro that has been upgraded to use a Metal-compatible GPU, you won’t be visiting the high desert anytime soon if your Mac was made prior to 2012. Mojave is mostly an evolutionary update to macOS. Nothing in it is particularly surprising, but most of what it offers will be welcome to a wide range of users. Apple seems focused on refining and enhancing macOS right now, rather than completely rebuilding it, and most of us think that’s a good thing. One final caveat: even if you can get your hands on the developer release of Mojave that Apple released today, we strongly recommend you resist the temptation to install it on any Mac that you need to use for anything other than experimentation. Did we say “strongly recommend”? We meant “will laugh callously at your sorrow if” you do such a foolish thing. Incidentally, that’s also what Wikipedia says. As usual, I am not really interested in most of these ‘improvements’ and what I would most appreciate is a simple way to decline them. Is it not possible to build in a ‘no thanks’ button? More generally, I have been keen on things Mac and a TidBITS subscriber for decades. But I am no longer a reader of most of the content. I am 77, and am not particularly interested in more choice and more complexity. I want to spend less time having to remember the new way to do an old task. When I speak with friends I find that almost everybody has the same priorities. Yes to necessary security but no to imposed changes that cannot be declined. Have I understood it correctly that Mohave will not be able to be installed on any Mac older than 2012? Macs introduced in mid-2012 or later, plus 2010 and 2012 Mac Pro models with recommended Metal-capable graphics cards. I guess that means none of my Macs will ever run Mohave. I’m liking Mojave, especially dark mode (this page blind me! :), but the real gold is actually under the hood improvements to the security model, in fact, BBEdit is coming back to the Mac App Store, which to me was a huge signal that a lot has been done in 10.14 that is going to make us all very happy. I’ve been busy filling away bugs today (all are appearance/behavior bugs, no crashing so far). Also, the integration of a lot of Workflow (the App) into iOS is extended to the Mac to some degree through the siri shortcuts, i think. Haven’t gotten to play with this yet, but this will be nice. Being able to control HomeKit via the Mac (FINALLY) makes me very happy. There’s all sorts of little things that are really nice, including a much more useful preview sidebar in the Finder. I can even rotate a video file right from the preview sidebar! I really hope that dark mode can be turned off system wide. I find that the usual combination of light gray text against a not quite black background doesn’t give me enough contrast to make the text legible especially at small font sizes. It looks to me like someone has smeared vaseline over the text. I don’t have any problem with black text on a white background at the same type size. Gruber’s Daring Fireball site is a mess for me. I know many people like the look but it reminds me of the bad old days in the early 1980’s staring at an IBM 3278 terminal and the horrible green phosphor text on a black background. The review article was very detailed, however, it seems to me there was one key item which was not included and that is: When is all of this Mojave release happening? I want to upgrade to High-Sierra (from Sierra) before the Mojave is available. I’m not sure they even mentioned availability, but my guess is around October or so, when macOS updates usually roll out. Count me in on this too, and Steve Jobs must be turning in his grave. It’s harder to read white text on a dark background. If you want to arrest a reader’s vision for a headline or a short phrase, it’s a good design strategy. Black blocks light, white and lighter colors scatters it and forces longer focus on each word. For paragraphs, blocks of text, or long lists, forget about it. I agree. I don’t mind the option for those that want a geek look or whatever, but I definitely want to be able to turn it off. I find that the usual combination of light gray text against a not quite black background doesn’t give me enough contrast to make the text legible especially at small font sizes. This seems to be something modern UI and graphic designers have forgot (or never been taught), that contrast matters a lot. A light interface or a dark interface doesn’t matter if that interface doesn’t have a high contrast between the important stuff and the background. The IMPORTANT thing to remember that it is NEVER pronounced “mo-JAW-vee” or worse “mo-jayve”! Interestingly, in Arizona the same name is spelled with an “H” instead of a “J” (probably to help the gringos pronounce it correctly)! Well, I took the plunge and installed it on my MacBookPro 15". I’ve only found two things that didn’t work so far. The are MailTags which is an add-on for Mac Mail, and LastPass in Safari. I need to recheck them after some changes and a reboot so we’ll see. I did get the option at install to use Dark Mode and I chose it. It’s great on a lot of things but some it’s just too dark. Thanks for the report. I’m tempted to install it on one of my machines. My understanding is that Apple has restricted Safari so that only extensions signed by Apple can be used. Doesn’t that DEFEAT the purpose of the beta? How will Apple know if, as usual, they’ve screwed up critical extensions like LastPass & 1Password? Regarding iOS crossovers, if they have dropped the plan to merge MacOS and iOS, why do they keep adding iOS items and functions to MacOS? If anything, the plan should be the reverse: add Mac OS items, functions, and features to iOS until iOS is almost totally subsumed back into MacOS. Then we could have MacOS running on iPads, while the remnants of iOS could be used on the iPhone & iTouch as both have no need of a lot of stuff currently in iOS. Regarding iOS crossovers, if they have dropped the plan to merge MacOS and iOS, why do they keep adding iOS items and functions to MacOS? Apple definitively confirms iOS and MacOS will not merge. And despite Apple’s denials, people can’t help spotting hints that Macs and iPhones may converge one day. It is much better than light grey text on a white background. like 99% of the Web. I’ve installed Mojave on both machine, dark mode all the way, and am busy filing bugs for all the places the dark moe is failing. Even with all the issues, it is a massive improvement for me and it much more readable. 1Password works just fine. So does Pipifier and Shut Up. uBlock Origins, otoh, does not. How can that be if Apple only allows Apple extensions to Safari in the Public Beta? It is not true that Apple only allows Apple extensions, it’s only Apple approved extensions. I’m liking Mojave, especially dark mode (this page blind me! 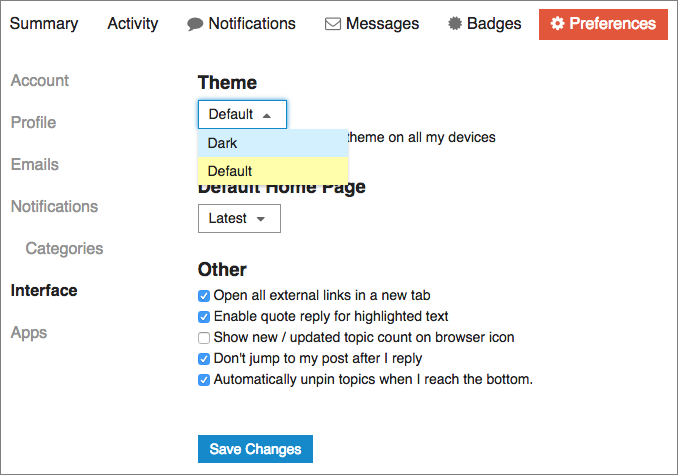 Discourse has themes, and you can switch to Dark Mode in your preferences. Haver you tried Discourse’ dark mode? I don’t love it, but then again, I don’t much like dark modes in general. Having the secondary title (which appears once you scroll) in a too-dark grey isn’t great, but it’s also pretty minor in the scheme of things). It’s probably easily fixable. There are a bunch of Discourse themes. If you see one you like, let me know and I can see about installing it. … “vibrancy adjustments”??? Whuzzat, please?